Blizzard Entertainment revealed the pricing plans for the Hearthstone: Curse of Naxxramas expansion. The announcement also reveals the release schedule for each of the four wings of Naxxramas. We’re skimming the slime pools, stitching together our finest Abominations, and preparing the Necropolis for an Adventure you’ll never forget—Curse of Naxxramas is coming, and we know you’re just dying to get in and play! In today’s blog, we’ll discuss the details on how you’ll access Curse of Naxxramas, and unveil the Naxxramas Heroic Mode. Naxxramas is a floating necropolis, home to a host of undead bosses ready to challenge worthy opponents eager to test their card-slinging mettle. To undertake the challenges that lie within each of the five wings of the Adventure, one must first gain access to their secrets. But don’t worry too much about the price of entry—much to Thaddius’ chagrin, it won’t cost you an arm OR a leg. Naxxramas will open its gates one wing at a time, with a new wing opening each week. The wings of Naxxramas will open in the following order: Arachnid Quarter, Plague Quarter, Military Quarter, Construct Quarter, and Frostwyrm Lair. Players who begin their adventures in Naxxramas during the launch event will gain free access to the first wing: the Arachnid Quarter. The launch event will last roughly a month or so, meaning you’ll have plenty of time to get your foot in the door—we’ll have more details to share about that later on. The web-choked corridors of the Arachnid Quarter are home to the bosses Anub’Rekhan, Grand Widow Faerlina, and Maexxna. Defeating these bosses will add new cards to your collection and give you a taste of the dangers that await you deeper inside Naxxramas. After the Arachnid Quarter, the next four wings can be purchased for 700 gold per wing or $6.99 USD per wing. Players can earn the in-game gold needed to unlock the next wing of Naxxramas by completing various quests or emerging victorious from the Arena, or they can choose to unlock the next available Naxxramas wing using real money. If you’re looking to swing open multiple gates at once, Curse of Naxxramas bundle packages are also available. Spiders are just so good at making things into neat little bundles. . . .
For European Naxxramas Wing Entry details, please go here. For Australian Naxxramas Wing Entry details, please go here. Keep in mind that purchasing Curse of Naxxramas wings in bundles does not open or grant access to those wings faster than the one-wing-a-week schedule, but it does ensure that you’ll be able to dive into the next challenges as soon as they unlock. 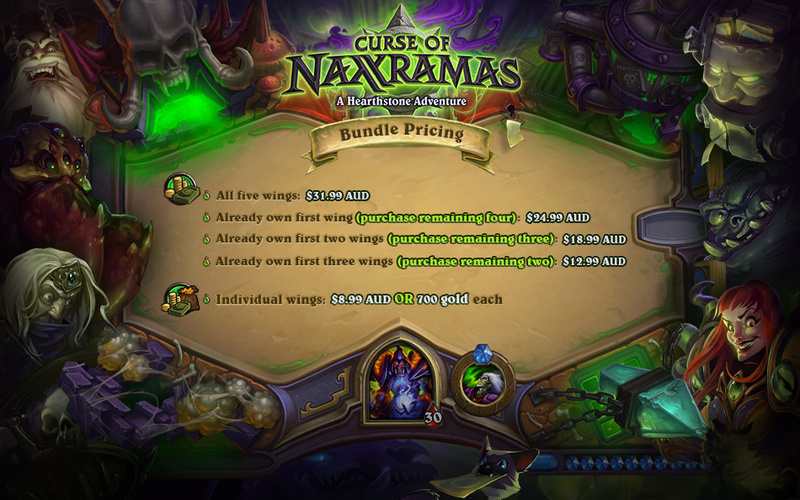 If you play Naxxramas during the launch event and decide to purchase the remaining wings with real money, you’ll only have to purchase the 4-Wing bundle to access the remaining wings once they become accessible. If you unlock additional wings with gold and wish to purchase a wing bundle at a later time with real money to unlock any remaining wings, you can still take advantage of the bundle pricing. For example, if you enter the Arachnid Quarter during the launch event and unlock it for free, then purchase the second wing with gold, the remaining three wings can be purchased with real money at the 3-wing bundle price listed above. Remember to enter the Necropolis during the launch event so you don’t miss out on all the creepy crawly fun that awaits you in the Arachnid Quarter—for free! Once you’ve defeated all of the bosses within any given wing for the first time, you’ll unlock the Heroic mode of that wing. Heroic mode bosses are significantly more difficult than their normal versions, and they will prove to be a challenge for even the most veteran Hearthstone players. Defeating all of the bosses in Naxxramas on Heroic mode will unlock a new card back for your collection. The undead horrors of Curse of Naxxramas: A Hearthstone Adventure are dying to meet you. We hope to see you creeping through the necropolis with your own “All Naxx-cess Pass” soon!